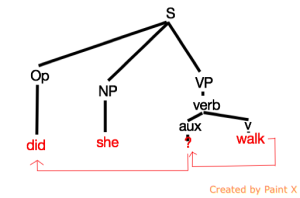 Now that all phrases had to have the same basic (XP, X-bar, X) structure, something had to be done about the Operator (Op) node. The Op node had to project the same X-bar structure, too. 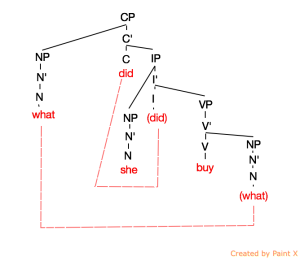 It was decided that the Op node projected into a Complementizer Phrase (CP). So we can imagine that the tense element starts off in the head of the IP and moves to the head of the CP in order to make the sentence into a question sentence. 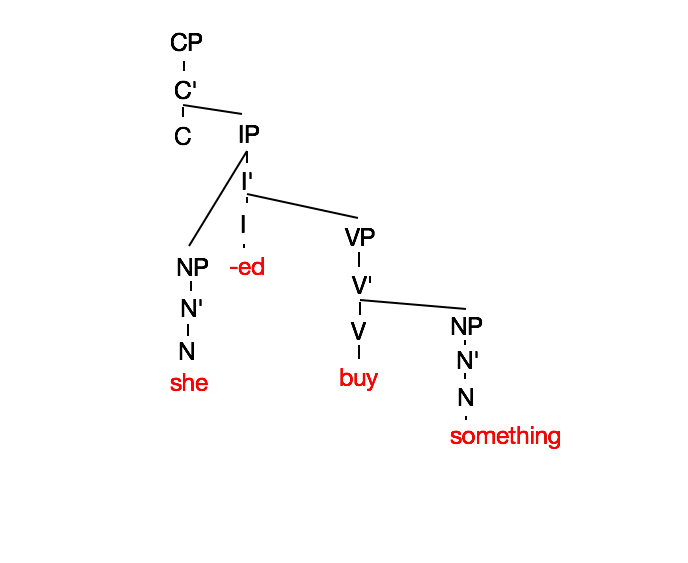 Now all our phrases look the same and have the same (XP, X’, X) structure. 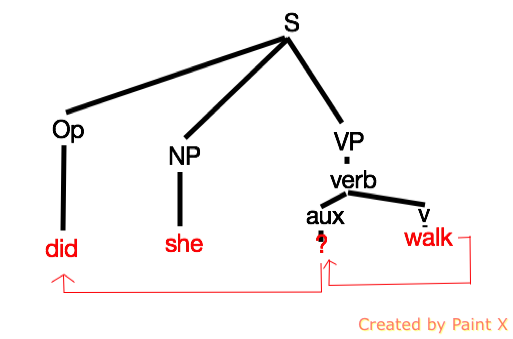 The bottom level is referred to as the head of the phrase. We can imagine that some kind of tense element moves from the head of IP to the head of CP, making the sentence into a question in the process. Notice how categories have complements hanging off from the right of X’. 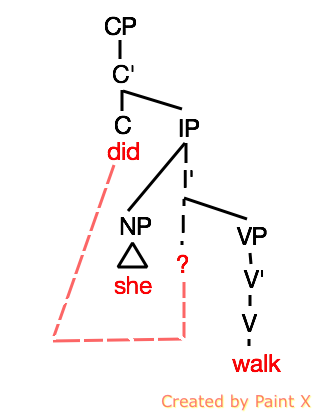 This kind of movement, referred to as move alpha (move α), became the most important part of Chomsky’s theory of syntax. Move α meant that you could pretty much move anything anywhere! However, there were rules (or principles) that limited this movement. These principles were then used to explain what kind of sentences were grammatical or not grammatical. So now we have all our categories looking the same. In a sentence like She bought something, we can say that the tense element is in the head of IP after some kind of invisible movement. In a sentence like Did she buy something? the tense element moves to the head of CP. Now what about a sentence like What did she buy? Where is the question word What? In 1 we can imagine that there is a tense element in the head of IP after some kind of invisible movement operation as we can see above. What about the following sentence? 2. 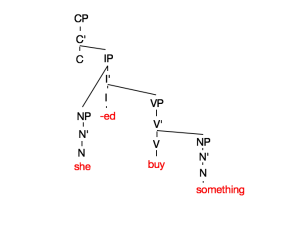 What did she buy? 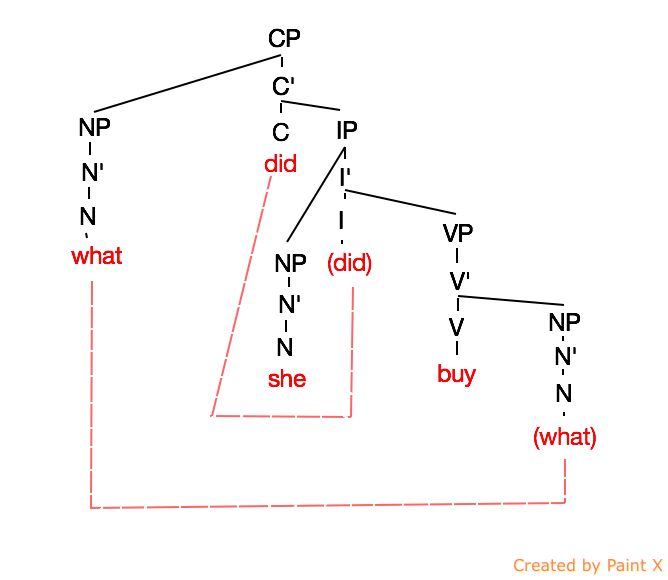 So maybe we can imagine the question word what has moved from the normal position as object of the verb buy to a position before the head of CP. Now it seems like the question word what has moved to some position before the head of CP. What is this position? So it seems that we have a nice, neat solution if we imagine that what moves to the position indicated above. It is hanging off to the top left of CP. The subject she is also hanging off to the left of the IP in the sentence above. What should we name this position? Looking at Noun Phrases gives us a clue. 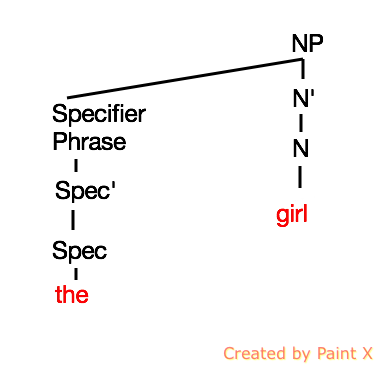 This category hanging off the top left of NP is called the Determiner or Specifier. It was decided that this position would be called the Specifier position or Spec. So movement of wh-words is to Spec of CP. Chomsky, N. (1986). Barriers. Massachusetts: MIT Press.